United Nations Plaza (Civic Center BART), SF. Near the public Obama inauguration simulcast event at Civic Center Plaza. Throw-A-Shoe at Bush! To Obama: No war! Join Us. Shoes provided or BYOS! Prizes, Music & Fun! 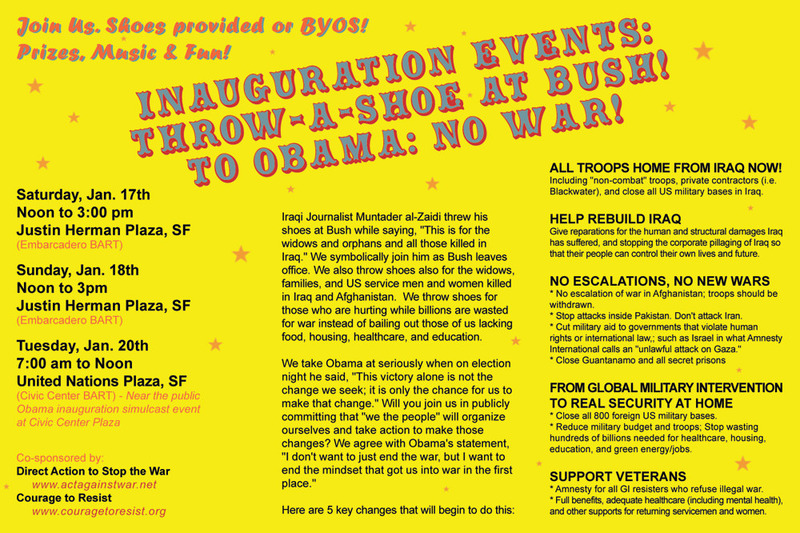 Tues., Jan. 20, 7 am - Noon, United Nations Plaza (Civic Center BART), SF. 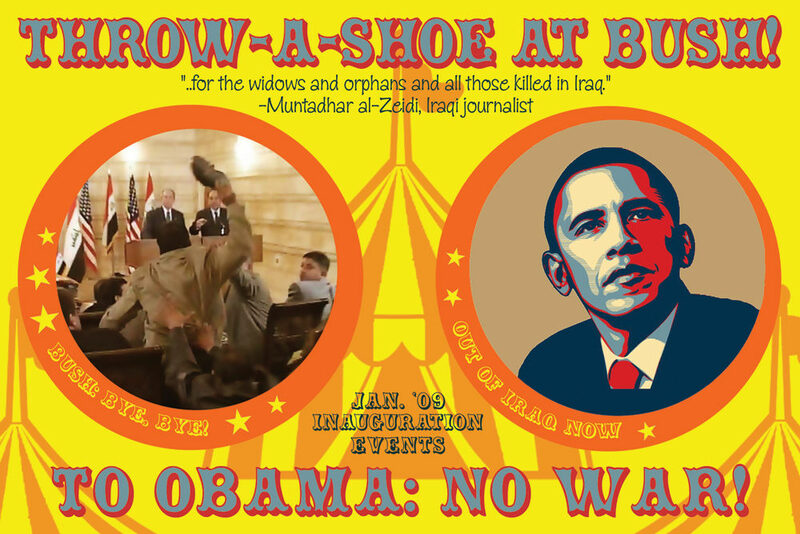 Iraqi Journalist Muntader al-Zaidi threw his shoes at Bush while saying, "This is for the widows and orphans and all those killed in Iraq." We symbolically join him as Bush leaves office. 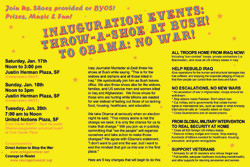 We also throw shoes for the widows, families, and US service men and women killed in Iraq and Afghanistan. We throw shoes for those who are hurting while billions are wasted for war instead of bailing out those of us lacking food, housing, healthcare, and education. We take Obama seriously when on election night he said, "This victory alone is not the change we seek; it is only the chance for us to make that change." Will you join us in publicly committing that "we the people" will organize ourselves and take action to make those changes? We agree with Obama's statement, "I don't want to just end the war, but I want to end the mindset that got us into war in the first place." Including "non-combat" troops, private contractors (i.e. Blackwater), and close all US military bases in Iraq. Give reparations for the human and structural damages Iraq has suffered, and stop the corporate pillaging of Iraq so that their people can control their own lives and future. * Stop attacks inside Pakistan. Don't attack Iran. * Cut military aid to governments that violate human rights or international law, such as Israel in what Amnesty International calls an "unlawful attack on Gaza."